The chip shop brings back many happy memories of my childhood. I remember how both my dad and myself would walk to the local ‘chipper’ for our weekend treat and how I would grasp the warm suppers, wrapped in the finest pages of the Daily Record, to my chest as we made the journey back. Markou’s low budget comedy drama side steps the destructive elements of the recent economic collapse by focussing on how it brings an estranged family together. 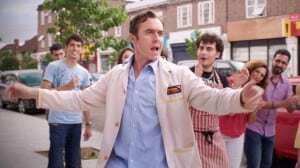 Stephen Dillane plays Harry Papadopoulos, a widowed father who has built a vast and lucrative food empire while caring for his three children with the help of strict but loyal nanny, Mrs P (Selina Cadell). Unfortunately Harry has lost sight as to what is most important to his children, namely his time. Oldest son James (Frank Dillane) is more interested in his plants than law school, daughter Katie (Georgia Groome) is spoiled and shallow and youngest son, Theo (Thomas Underhill) is happiest while gazing at stocks and shares on his laptop. When Harry borrows too much money to fuel further business growth, the second economic collapse hits the United Kingdom. The family lose everything bar a small sum of money and the family owned chip shop co-owned by Harry’s brother (Georges Corraface). The brothers have not spoken to each other for years due to Spiros’ drinking problem. The brothers agree to resurrect the business and then sell it on once its stock has risen. Despite the scoffing of his immoral lawyer (Ed Stoppard), Harry continues in his quest to build the best ‘chipper’ in town. He also discovers how happy his family are in their new lifestyle. Many will criticize the blatantly optimistic and upbeat nature of Markou’s film. It suggests that one has to lose everything to discover that they have everything. Yet Papadopoulos and Sons does achieve its goal to entertain its audience.. This is predominantly due to a thoughtful and restrained performance from Stephen Dillane as a father that learns that his family is worth far more than any multi-million food empire. The supporting cast are wonderful too. There is an endearing chemistry amongst the family members and the final dance off is as heart warming as it is purposely awkward. Papadopoulos and Sons has no twists or surprises in its story yet it will leave you with a big stupid smile on your face. Fighting for clean bathrooms and restrooms since 1974.